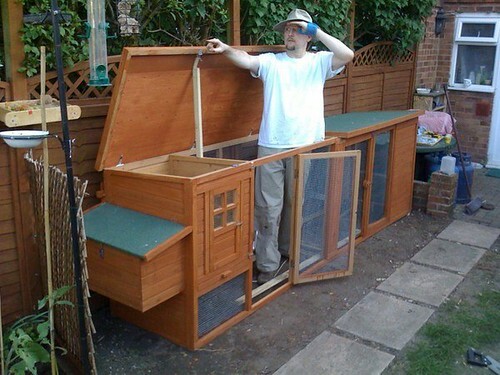 For a 30th birthday present for Chris I brought a hen house and signed up for four rescue hens from the British Hen Welfare Trust (BHWT) – (BHWT are also on Facebook). The hens are extra battery farm layers. The poor things are devoid of most of their feathers an have weak legs from their hard life in the battery farm. The BHWT rescue these hens – which are only 18 months old – from the battery farms at the time the farms send the hens to the chicken equivalent of a wood chipper. The lucky hens get taken on by people to be given a better life in family and free range farm conditions. We had to wait for a slaughter date for our hens to become available. 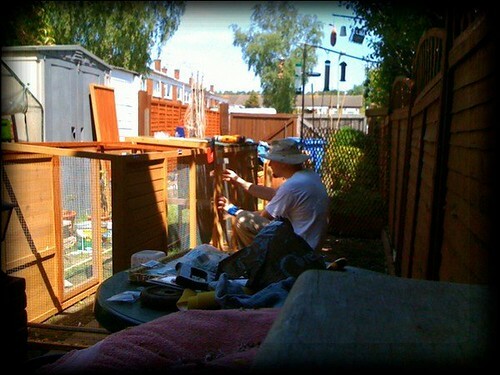 In the time it took the hens to become available I had built a hen house (from Hen House World). Hen House World bent over backwards to ensure I had all I needed. In fact after I told them of the modifications I wanted to carry out (lift top roofs, extended run area, guttered mid section and remote lighting), they were happy to send me spares that were in unsaleable conditions due to minor defects – all I did was pay postage. Two months after we embarked on the hen rescue we finally received our birds. I went to pick them up with Alex as Chris was at work. The pick up place had all the birds that had been assigned new lives (and not destined for the wood chipper). Seeing these pale, feather bare hens with hardly any weight to them was quite shocking really. 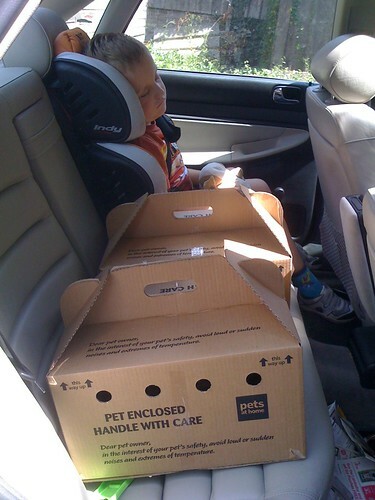 By the time we got to the pick up, Alex had fallen asleep and was quite surprised when on the way home the boxes started clucking! He wasn’t aware we’d picked them up at all! 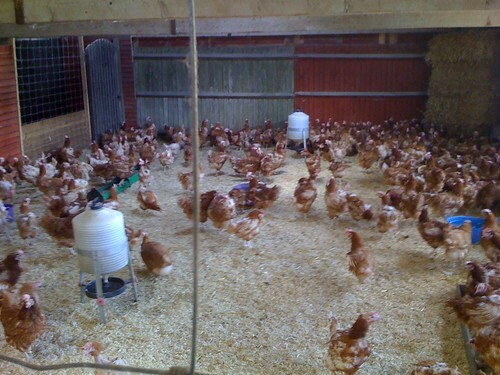 Once home I moved them over into the custom coop! They didn’t put up much fuss being handled and were quite quiet as they started to explore. 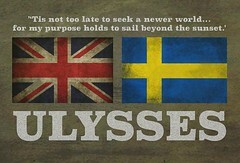 It was now that I could see how feather bare and pale they were. 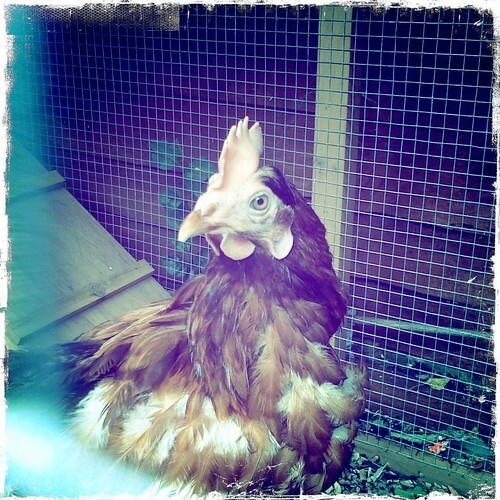 After a peaceful first day and an early night, the hens awoke the next morning to prove themselves fully functional! 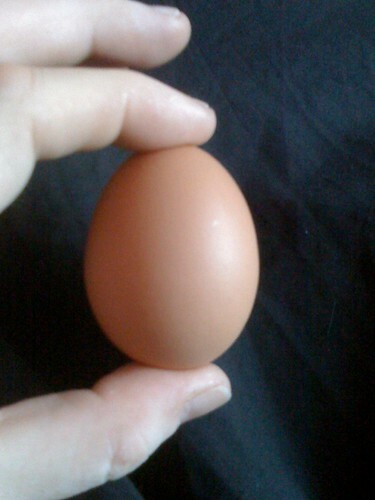 Chris went down and let them out of their bedding area into the coop at 6am… a few moments later I was woken up as she excitedly showed me a fresh warm egg. Over the next hour two more were produced – including one that was so big it needed some Vaseline help… Now they are settled it should be easier for them…. Chris was disappointed to not actually see an egg layed – and slightly annoyed that I went out to see the girls at 8am only to have one walk in front of me, stop, drop egg, then walk off! Egg number four had been delivered! A little later we picked up some wire and posts to build an extended open run. 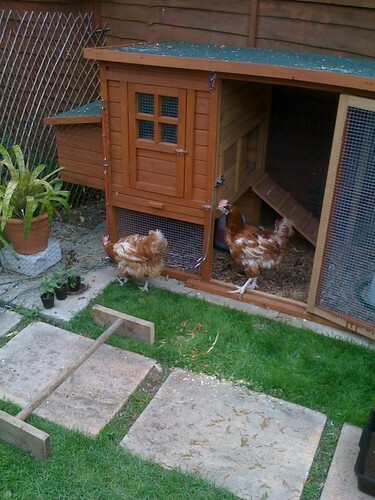 Once I had built this (and Chris had clipped the hens flight feathers and tagged them) the hens were free to roam…. but it took a while! 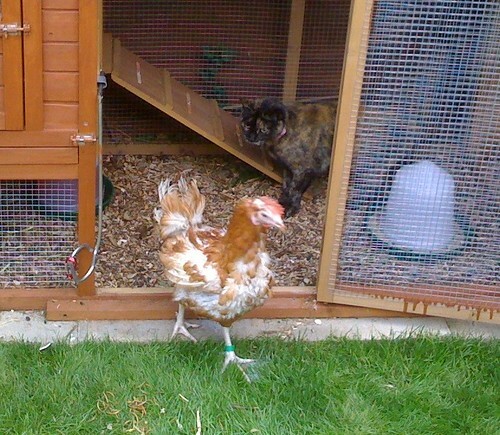 It has been said that ex-battery hens are fearless. I guess it’s because they are used to so much stress in the battery pens that anything else is child’s play! Cats on the other hand, are less brave of a new arrival in their lives! 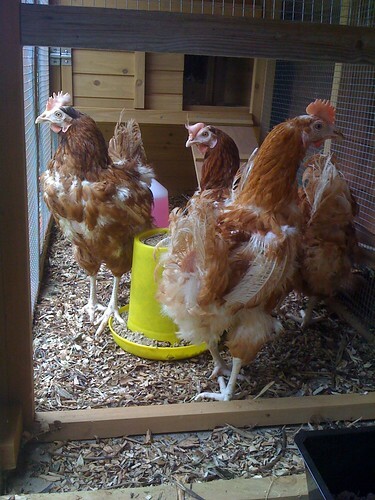 Our three all took wide berths as they passed the coop, but slowly they became more curious…. or at least Spice did…. 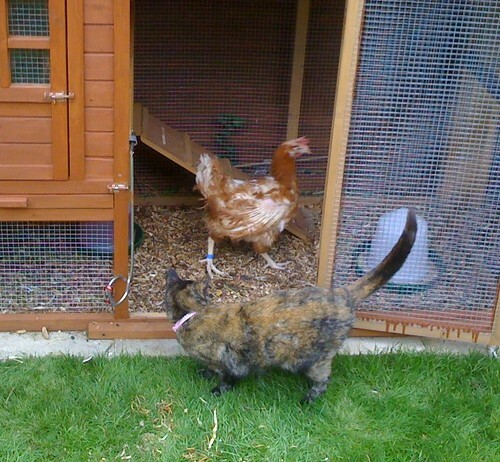 The cats and the hens are getting on very well – probably due to the fact that the hens are bigger than the cats (in height anyway) and there are more hens than cats…. and the fact that our cats are pretty soft in the head! We end their first full day with the girls being happy, free and already perking up! Notice the colour in their combs – pinking up already! Alex named one “Eleven” – maybe a Spinal Tap reference… although he is only four! Chris named one “Crispy” – As in KFC. I named “Terri” (Theresa) due to the green leg tag. I also named one “Mel” – bravest one who explores everything before anyone else… and is nuts. 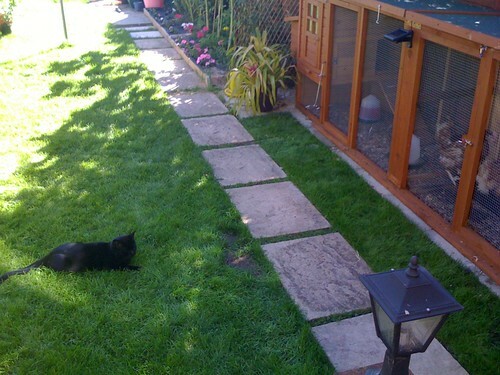 This entry was posted on Sunday, July 4th, 2010 at 9:45 pm	and tagged with bhwt, british hen welfare trust, cats, chicken, coop, facebook, feed, hen, hen house world and posted in Family, Pets. You can follow any responses to this entry through the RSS 2.0 feed. we thought about chickens in the back yard. zoning issues and raccoons, many many raccoons, changed our minds. looks like fun, and fresh eggs without any weird science experiment feeds make this a great hobby!